A series of innovative events bringing to light, in London, the work of writers fundamental to the unique Austrian contribution to world literature in the post-war era. These events, by commissioning contemporary artists, writers, poets and theatre makers to each make a new work responding to the works or life of the celebrated figure in question, aim to transpose the brilliance of the original into a new moment – one that will stimulate as well as illuminate. Featuring entirely new commissions from a host of artists and writers from Austria, the UK and across Europe. Join us for a unique event celebrating writers whose output and oeuvre was distinctly affected by the UK, their second, or eventually first, home, and writers who wrote significant works while living in the British isles. This event owes itself to the knowledge and ideas of Stephen Watts, one of the UK’s finest living poets, translators and poetic archivists, whose considerable interest in Austrian poetry has brought together these figures below. Dominic Jaeckle is a (poor) researcher, (occasional) writer, (amateur) broadcaster, publisher and editor of the occasional magazine Hotel and its adjacent projects. His collaborative collection of photo-poems, 36 Exposures [with photographer Hoagy Houghton] is due for publication by Dostoyevsky Wannabe in 2020, and Jaeckle’s writings and editorial works have been published and exhibited internationally. Andrea Capovilla is the director of the Ingeborg Bachmann Centre in London. She has taught German literature at the universities of Vienna, Oxford and Cambridge. Her special interests include Austrian writers, women’s writing and the literature of exile and migration. Oliver Goldstein is a writer based in London. He’s currently finishing up his PhD on nineteenth century verse at the University of Cambridge. Some of his poetry has been published in Hotel. He also writes about boxing for a number of different publications. London based artist Bettina Fung | 馮允珊 creates two dimensional, performative and site specific works. Her practice centres on drawing and focuses on its performative aspect. She draws live at exhibitions, sharing her process and allowing her work to unfold overtime. She is drawn to the liminal space between nothing and existence that is potent with possibilities. Themes of ritual, futility, purposelessness and notions of productivity and progress are subjects of interest. Bettina’s background is in computer animation, where she gained her degree in Bournemouth University (NCCA) in 2005. She has exhibited nationally and abroad. She was the recipient of awards such as the a-n Artist Information Company's New Collaborations Bursary in 2014 and Arts Council England’s Grants for the Arts award in 2018. Bettina is currently taking part in Syllabus IV, an alternative peer led artist development and learning programme, and is an Associate Member of the Asia-Art-Activism Research Network. Perhaps no 20th century European author expresses so vitriolically, so powerfully and so truthfully, an utter disdain for pretension, intellectual and emotional laziness, and stupidity. Thomas Bernhard's immense output of novels, theatre and poetry is often marked singularly by a tone of contempt, unapologetically against hypocrisy and pompousness. Fully realised in Bernhard’s work is the irony of an author who felt compelled to demean publicly the very idea of culture and thereby provocatively offend the public’s complacent sense of cultural identity, and in so doing provide his own output with a meaning based on its lack of meaning. Bernhard’s genius was that, at great artistic risk, he achieved his aims by undermining his achievements. Featuring Maja Jantar, Raphaela Edelbauer, Tereza Stehlikova, Oliver Evans, Christian Patracchini, SJ Fowler and Sophie-Carolin Wagner . 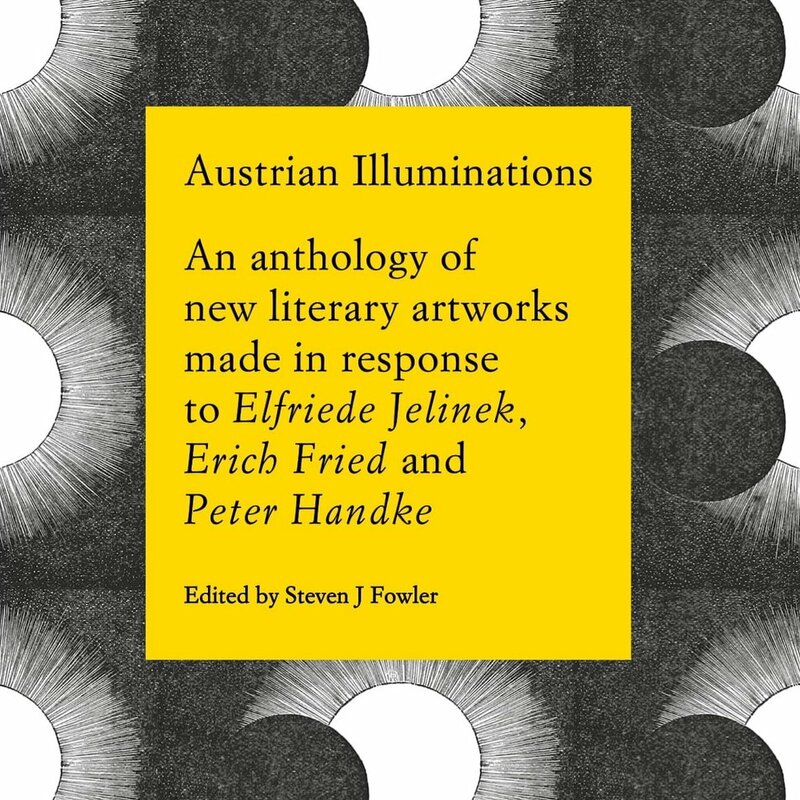 Austrian Illuminations Anthology Launch - May 10th 2018 at ACF London. Bringing together over 15 new literary artworks made by the artists and writers commissioned for Illuminations events celebrating Elfriede Jelinek, Erich Fried and Peter Handke, this beautifully designed limited-edition anthology will be launched in London with readings and performances from contributors. The anthology is issue 17 in the ACF's remarkable Occasions series, a publication project celebrating the groundbreaking work they do, and was designed by www.polimekanos.com in London. Featuring live works by David Rickard, Iris Colomb, David Fried, Joshua Alexander, SJ Fowler and more. http://www.acflondon.org/events/illuminations-iii-peter-handke/ One of the world's foremost novelists, playwrights and poets, Peter Handke's body of work is a question to the entire consciousness of post-war Europe. Wholly singular, often particularly divisive, Handke's work creates an intensity out of the observational, skewers complacency and layers literature with the kind of distant complexity and forceful difficulty that actual living tends to bring. His work has been a beacon of critical and prolific experimentation, and his polarising persona and numerous works have forced European novelists of the last 50 years to, at the very least, accept or reject his style and substance. His output is remarkably underappreciated in the UK, if not generally unrecognised and so this event, in a small way, aims to rectify a considerable imbalance. This event featured responses to Handke's work by contemporary writers and artists. Verena Duerr, vienna-based musician and innovative lyric poet presents a made-for-the-night sound performance / Eley Williams, acclaimed fiction writer and poet presents new prose / SJ Fowler leads an in house mushroom forage / Stephen Watts reads Handke through his friend WG Sebald's critical writing / Phil Baber, amsterdam-based writer, typographer, and publisherpresents new translations and publications of Handke's Repetition and To Duration. French poet Iris Colomb responds to Handke's Public Insult. Erich Fried, one of the great political and love poets of the post-war era, whose strikingly beautiful and immediate poetry found no contradiction in those themes, is celebrated on the grounds of Kensal Green Cemetery, where he rests. Fleeing Vienna to make his home in London during WWII he left a profound impact on both places, celebrated by readers through his life and into the current day in Austria especially, this event aims to shed new light on a great poet of Europe. 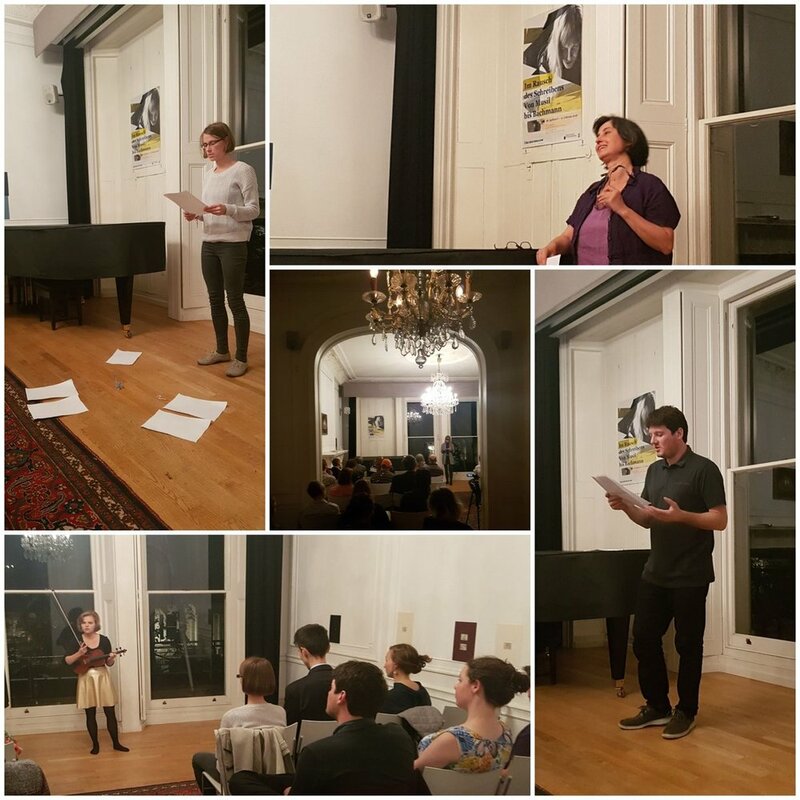 The event featured new performances, poems and artworks from Robert Prosser, Cohen & Van Balen, David Fried, Joshua Alexander, John Parham, Maeve Conway Fried, and Stephen Watts. Pictures below by Madeleine Elliott. A brilliant first instalment of the Illuminations series : Elfriede Jelinek is one of the most powerful literary figures in Europe, a novelist and playwright of remarkable authority. Her work is marked by its purposeful originality and cutting exposure of bourgeois sensibilities. Profoundly appreciated by readers in continental Europe and beyond, Jelinek's work is not only vitally contemporary, it is ever more relevant in the UK. Jen Calleja is a writer, literary translator from German and musician. Her debut poetry collection Serious Justice was published by Test Centre last year and her writing has featured in Ambit, 3:AM and Austrian literary journal Podium. She has translated fiction and non-fiction by Gregor Hens, Kerstin Hensel, Wim Wenders, as well as interviews with Pina Bausch. She also writes a column for The Quietus on literature in translation. Patrick Coyle (b. 1983, Hull, UK) is an artist working predominantly with performance, writing and sculpture. He recently delivered performances at Central Booking, New York; White Rainbow, London (with Jenny Moore); Danielle Arnaud, London, Global Committee, New York; El Tercer Lugar, Buenos Aires; Westminster Reference Library, London; Catalyst Arts, Belfast; Institute of Contemporary Arts, London; Tate Modern, London (with SJ Fowler); Oxford Central Library; Ferens Art Gallery, Hull; Pump House Gallery, London and Whitechapel Gallery, London. Recent exhibitions include Concrete Plastic, LAM GALLERY, Los Angeles; Rest & its Discontents, The Mile End Art Pavilion, London; The Place Where He Is Meant To Be Lost, The Third Policeman, New York; Trim Your Tongue, DKUK Salon, London; fig-2 28/50 Patrick Coyle & Francesco Pedraglio, Institute of Contemporary Arts, London; It Said, ANDOR Gallery, London and You Cannot Step Twice Into The Same River, Pump House Gallery, London. Coyle recently completed a residency at The Hub, Wellcome Collection, London. Josh Alexander is an artist who makes experimental and surreal narrative and non-narrative moving image work. In 2016 he was commissioned to make new work for A World Without Words. In 2015 he was commissioned to make new work for Kakania, and in 2014 he was commissioned by the Czech Centre in London to make new work for the live event Cabaret Hrabal. In May 2014 he had a solo exhibition of video and photography called Light on Paper at Hardy Tree Gallery, London. In October 2015 he made the music video for Universe in Two by Ultra, he also made the music video for Drowned at Sea by Fairewell in 2013.